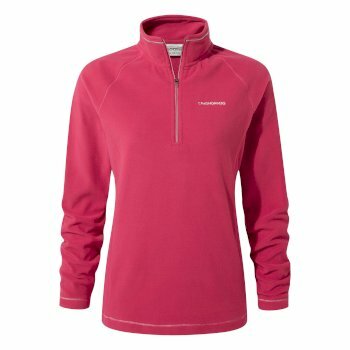 Stay warm and comfortable with our varied range of women’s half zip fleeces at Craghoppers. With a varied range of styles and colors in our women’s half zip fleece range, you can tackle all your outdoor adventures without having to worry about the elements. Stay insulated with an extra layer for your next excursion with a women’s half zip fleece. Our range of half zip women’s pullovers is designed to offer the thermal insulation needed when conditions demand for something a little warmer. Made from efficient microfleece fabric, our women’s half zip fleece pullovers are also lightweight and easy to pack away for when the weather picks up and you need to strip back a layer. A number of our women’s half zip pullovers are equipped with a breast pocket, allowing you to keep your valuables safe while on your adventures, making our range of half zip women’s pullovers practical too. Our range of women’s half zip pullover fleeces for women are available in a selection of colors and designs, so you can set off on the trail feeling comfortable and stylish. Our women’s half zip fleece jackets are available in soft pastel colors such as corals, powder blues and light yellows. For something a little more neutral, darker colored women’s half zip fleeces are also available in black and navy blue – classic designs to match any outfit. Our women’s half zip sweaters are part of our whole selection of women’s fleeces. Explore our range of women’s half zip fleece pullovers today to find the perfect design for you, and hit the trail in style.